Mrs. Gillen's Kindergarten: What a busy first week of Kindergarten! What a busy first week of Kindergarten! Follow the link below to get a copy of what we did last week. We have learned a lot of skills for completing our work with our best effort. These few days spent working on expectation and behavior will pay big dividends when it comes to making gains academically. We are working so much with play dough that I am asking each child to bring a 4-can package of play dough. 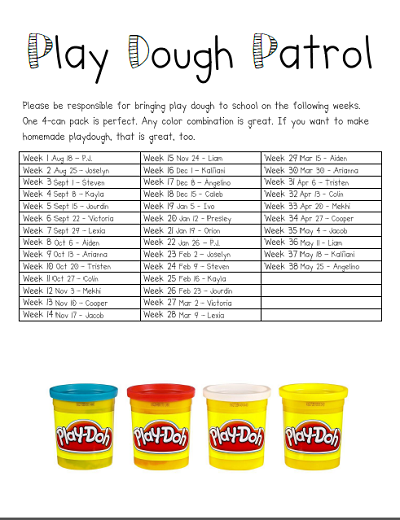 The attached list will let you know when your week to sponsor play dough is.